Ben Grady with his first snapper. Since moving to Blenheim from Canterbury I‘ve been fortunate to meet up with Jim Hobby a local trout fishing guru. Jim’s been showing me how to tie some secret Marlborough Nymphs and Dry ﬂies. He has given me some assorted copper wire, which he ripped out of old telephones. The wire comes in all different colours and is great for the smallest nymphs. Soon it would be my first introduction to Marlborough snapper. Our catch for the day! 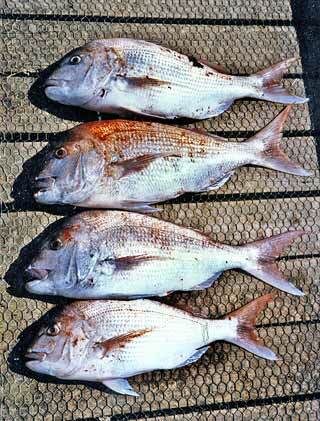 Four Kenepuru Sound snapper. 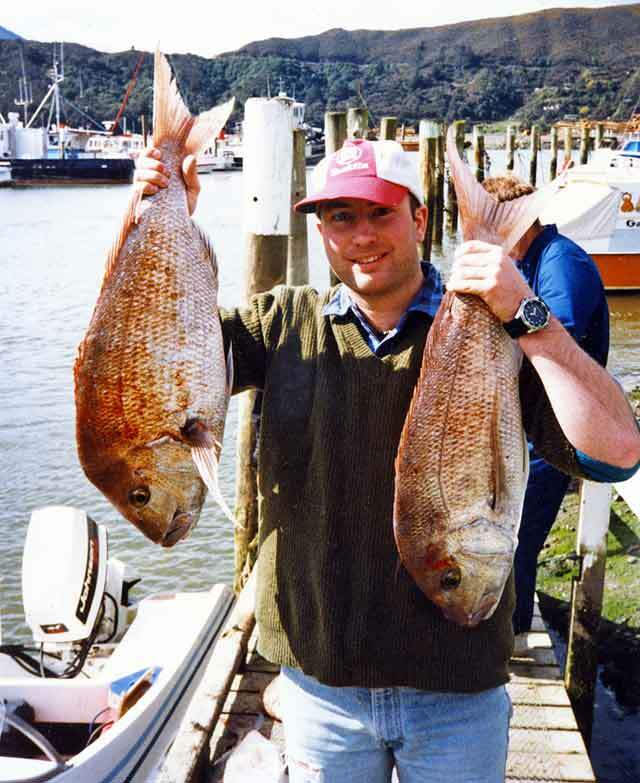 Just recently I had the opportunity to go out snapper fishing in the Kenepuru Sound. Jim has a fifteen-foot runabout with a seventy horse Johnson behind it, so it wasn’t long after leaving Havelock that we were fishing. I was using the usual running sinker rig with the good old Pilchard for bait, Jim Hobby and his son Jesse, had lost the plot altogether and were baiting up with Chicken necks. I had never caught a Snapper before so I wasn’t about to say anything. Jim put us onto a hotspot straight away and young Jesse hauled up a red cod (caught on a chicken neck). Next thing something grabbed my pilchard and my light rod bent in half. “Its a snapper,” I yelled, as it had some weight to it. But the fish didn’t run so I wound in line. The next thing a skate came up to the surface! Only a few spotty bites then Jesse’s line started pulling off his reel. Jesse struck and he hooked into a snapper. “Argh Jimmy, have yee got any more of those chicken necks,” I said, looking around the boat. There were no more bites for a while so we moved on. The next spot was so secret, Jim made me swear an oath to the grave and he demanded I wear a blindfold! Well, it wasn’t far off that anyway. I was the first to get a decent bite this time, so I struck hard and again my rod bent in half. This wasn’t another skate! This time it was stripping line from my reel. “It must be a snapper,” I thought. It was running much like a salmon, so I tightened the drag a little and ten minutes later I proudly held my first snapper as Jim took a photo. 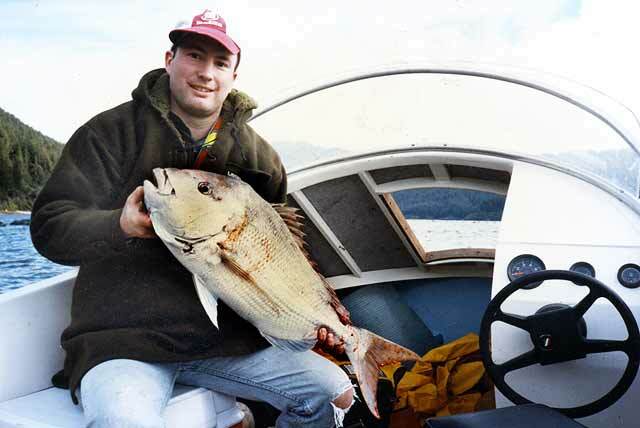 Not long after I had another Marlborough snapper of the same size, just over ten pounds. Jim was to follow with a smaller one, then a big bugger of twelve pounds. I know where I’ll be fishing when the trout rivers are dirty! As we pulled into Havelock and were winching the boat onto the trailer, Rob Merrilees from N.I.W.A came over and did an interview for Marine Research. Rob asked us a few questions and measured our catch, (not that his measuring board was big enough). He wasn’t policing and didn’t want any names, just some data for a survey. So me, Jesse, and Jim “Chicken Neck” Hobby called it a day and drove home reliving our adventure. Hurry up. I’m getting sore arms. Photograph, Jim Hobby.